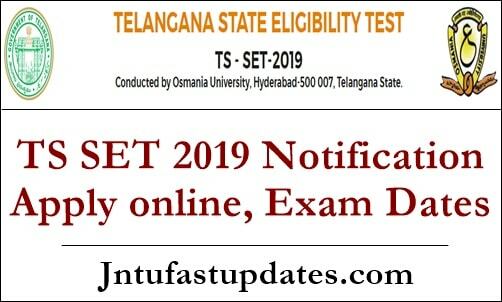 TS SET 2019 Notification Apply Online: Telangana State – State Eligibility Test 2019 Notification, Exam dates, Online Submission, fee structure, eligibility, Exam centres available at telanganaset.org. Telangana State – State Eligibility Test (TS-SET-2019) for the year 2019-20 will be conducted by Osmania University, Hyderabad in accordance with G.O. Ms. No. 16 Dt. 09-06-2016 for recruitment and promotions of Lecturers/Assistant Professors in Degree Colleges/Universities as per the University Grants Commission Regulations. Eligible Candidates who wish to apply for TS-SET-2019 may submit their applications through online mode. The registration fee of Rs.1000/- (for General Category), Rs. 800/- (for BC Category) and Rs. 500/- (for SC/ST/PWD Category) towards application registration and processing is to be paid through payment gateway (Credit card/Debit card/Net banking). The detailed information is available on the website www.telanganaset.org. a. Only those candidates who have completed or are pursuing the final year of PG degree in related subjects are eligible to appear TS-SET. Others need not apply. b. Candidates who have secured at least 55% marks (without rounding off) in Master’s Degree OR equivalent examination from universities/institutions recognized by UGC are eligible for SET. The Backward Classes (BC) / Scheduled Castes (SC) / Scheduled Tribes (ST) / Physically Challenged (PH/VH) category candidates who have secured at least 50% marks (without rounding off) in Master’s degree or equivalent examination are eligible to appear the SET. c. Candidates who have appeared (OR) will be appearing at the qualifying Master’s Degree examination and whose result is still awaited (or) candidates whose examinations have been delayed may also apply for this test. However, such candidates will be admitted provisionally and shall be considered eligible for award of Lectureship eligibility only after they have passed their Master’s Degree examination (or) equivalent with atleast 55% marks (50% in case of BC/SC/ST/PH/VH candidates). Such candidates must obtain their P.G degree mark sheet within one year from the date of SET with the required percentage of marks, failing which they will be treated as disqualified. d. Ph.D. degree holders whose Master’s level examination had been completed on or before 19th September 1991 (irrespective of date of declaration of result) shall be eligible for relaxation of 5% of marks from 55% to 50% to appear in the SET Examination. e. Candidates have to appear for SET in the subject of their Post-Graduation only. In case the subject of a candidate is not included in the list of SET subjects, the candidate may appear in UGC-NET / UGC-CSIR NET which is held twice a year. f. The candidates who qualify in the test are eligible to apply for the post of Asst. Professors / Lecturers in various universities and degree colleges of higher education in Telangana. They will be given eligibility-certificate and the validity period of certificate is forever. g. Candidates other than general category are required to mention of their social status (BC/SC/ST/VH) in the online application form. The candidates in their own interest must satisfy themselves about their eligibility for the test. In case their ineligibility is detected by the Agency at any stage, their candidature will be cancelled and they shall be liable for legal action. h. Candidates may note that the verification of eligibility conditions with reference to the documents (PG qualification certificates, caste certificates and certificates related to PH/VH) as may be called for will be taken up only after the candidate has qualified in the test. If in the event of the candidate being found ineligible at any stage for the award due to any reason, the award may be withdrawn by SET agency. i. Candidates should note that their candidature is provisional. The mere fact that an admission card has been issued to a candidate will not imply that the university has finally accepted his/her candidature. Candidates may note that their candidature will be deemed final upon verification of eligibility conditions. j. The candidates will not be given any mark sheet from the SET office whether they have qualified or not qualified. No revaluations of papers are allowed for SET Examination. The SET agency will issue certificates to the qualified candidates only after careful verification of the concerned certificates of the candidate. k. The same photograph of the candidate which is printed on the hall ticket will also be printed on the certificate to be issued by the Office of the TS-SET. There is No Upper age limit to apply for TS-SET examination. A candidate can avail any number of chances. a. TS-SET shall remain the minimum eligibility condition for recruitment and appointment of Assistant Professors in universities/ colleges/institutions. However, the candidates, who have been awarded a Ph.D. Degree in accordance with the University Grants Commission (Minimum Standards and Procedure for Award of Ph.D. Degree) Regulations, 2009, shall be exempted from the requirement of the minimum eligibility condition of SET for recruitment and appointment of Assistant Professor or equivalent positions in universities/ colleges/ institutions. b. For SET Candidates: The candidates who have cleared the State Eligibility Test (SET) accredited by UGC for eligibility for Lectureship held prior to 1st June 2002, are exempted from appearing in NET, being eligible to apply for Lectureship anywhere in India. For SET held from 1st June 2002 onwards, the qualified candidates are eligible to apply for the post of Lecturer only in the universities/ colleges belonging to the state from where they have cleared their TS-SET. sir I'm studying PG final year last semester so may I apply this set? Marks entered wrong ly.can l change? The site is not working to apply TS SET, please guide me how to do it? ts set application form not available in web site. how to apply?.